DETAILS: Our Swarovski Crystal birthstone charm necklace makes a beautiful personalized gift she will love to receive on any occassion. 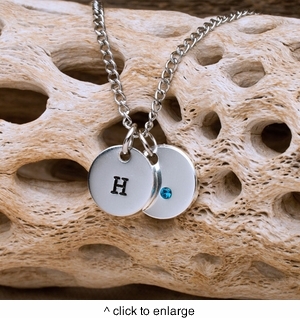 Choose the month(birthstone) for one pendant and one initial for the other pendant. The chain measures 12" when closed and 24" from end to end. Comes in a white gift box.